In the spirit of Thanksgiving, give the gift of healthy cocktails! The appropriately named Roman Holiday, not only looks festive with its bright, punchy red hue and star of anise garish, but the taste is just as merry too! 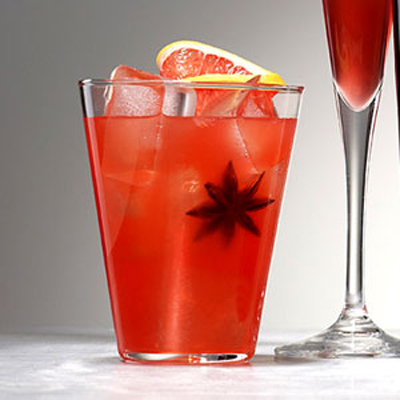 It’s difficult enough to simply find a low-calorie cocktail at holiday parties let alone a healthy one, but this Thirsty Thursday recipe delivers just that. This sweet and tart blend aids digestion, which is perfect after a big Thanksgiving meal. The bitters and homemade star anise nectar (recipe to follow) naturally soothe the stomach. To make the Star Anise Agave Nectar, which is a much better option than loads and loads of sugar or store-bought simple syrup, simply bring ½ agave nectar and 4 star anise pods to a simmer. Cool, strain, and discard pods. Voila!